Leading supplier, trader, bulk exporter of antiviral drugs, antiretroviral drugs and Several HIV treatment medicine and drugs. Antiviral drugs are a class of medication used specifically for treating viral infections. Like antibiotics for bacteria, specific antiviral are used for specific viruses. Unlike most antibiotics, antiviral drugs do not destroy their target pathogen; instead they inhibit their development. Antiretroviral drugs are one class of antimicrobials, a larger group which also includes antibiotic (also termed antibacterial), antifungal and antiparasitic drugs. Best HIV and antiviral drugs are Lamivudine, Tenofovir, Zidovudine, Entecavir, Ritonavir, Nevirapine, Indinavir, Abacavir, Adefovir, Saquinavir, Ganciclovir. With years of experience, we are engaged in processing a large gamut of Lopimune Tablets. High quality ingredients we have utilized in formulating these tablets that are sourced from some of the genuine and authentic vendors of the industry. Our hygienically processed these tablets are known for their safe consumption, reliable packaging, best quality and affordable rates in market. 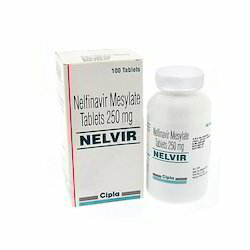 We are instrumental in processing Nelvir Tablets. These tablets may be taken as prescribed by the doctors only. Due to their zero side effects, reliable usage, proper packaging, and effectiveness, these tablets are widely demanded and appreciated by our huge clientele. We offer these tablets at most economic rates in market. Our well trained and dedicated professionals help us in timely delivery. Backed by our rich industry experience and hi-tech machines, we are involved in offering Tenvir-EMTablet to the clients. 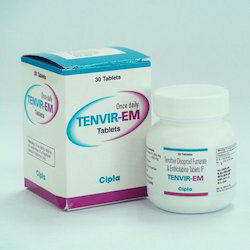 Tenvir-Em is indicated in combination with other antiretroviral agents (such as non-nucleoside reverse transcriptase inhibitors or protease inhibitors) for the treatment of HIV-1 infection in adults. These tablets have accurate composition and are used for the treatment of various serious ailments. We have fully tested these tablets in order to ensure that these are free from all sorts of contamination. 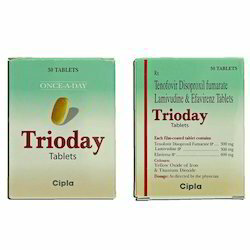 Since the inception of our organization, we are involved in offering Trioday Tablet to the clients. These products are formulated by the expert & dedicated team of professionals who are well versed with the exact requirements of the esteemed patrons. Our products are available at market leading prices and can be customized in various sizes as per the specific demands of clients. In order to meet the rising demands of the medical fraternity, we are supplying these in bulk. 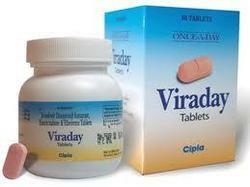 We are one of the trusted processor of Viraday Tablets which are processed and developed by utilizing the best available technology methods. 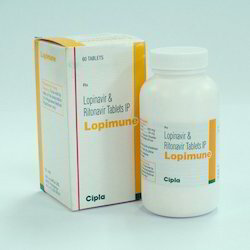 We have formulated these tablets in adherence with the international quality standards. Our clients can avail these tablets in different sized packaging and at feasible rates in market. These tablets are known for their optimum results and zero side effects. Looking for HIV Drugs - Anti Viral Drugs ?